Since kicking off Green Beauty month, I keep getting emails and messages asking about my favorite natural cosmetics brands. Last year, I put together a list of the great organic makeup items I started integrating into my routine. But since skincare is really the first place to start, it seems silly that I haven’t given you that specific leg up into the world of naturals for your body and face. I’ve done a lot of trial and error this year. And now that I’ve found organic skincare brands that really work for me, part of my challenge this month is to start de-hoarding all those other generic products that no longer serve me. 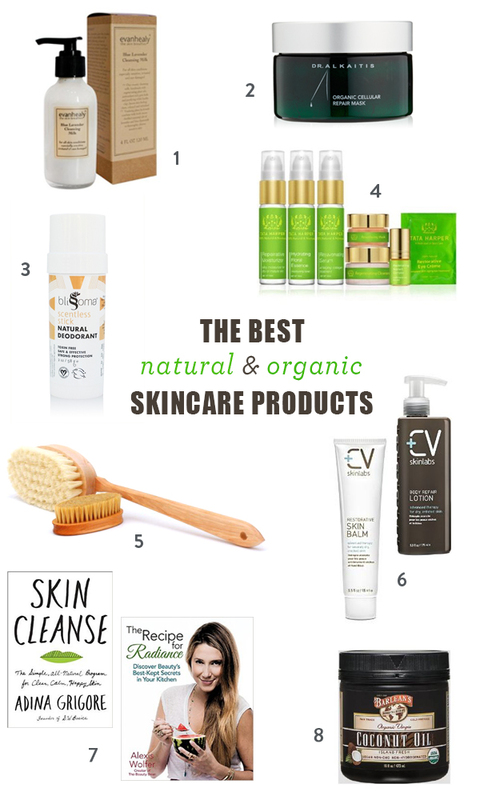 In the meantime, here are some of the great natural, organic cosmetics I’ve been using as part of my new green beauty routine. 1. Gentle Cleanser and Moisturizer for Sensitive Skin: Evan Healy . These are some of the first products I tried and I instantly loved how soothing they were on my skin, which was so inflamed at the time. If you’ve battled perioral dermititis or other sensitivity disorders, give the Lavender Cleansing Milk and Blue Chamomile Moisturizer a try. 2. Weekly Mask For Maintenance and Extra Glow: Dr. Alkaitis Organic Cellular Repair Mask . I got this mask from CAP Beauty and have been loving the way it makes me skin feel. It’s made from real berries and you can smell them on your face! Because it’s a dry formula, it keeps longer than most all natural products. Simply add a few teaspoons of water and create your own paste for your face. 3. All-Natural Stick Deodorant That Actually Works: Blissoma Scentless Natural Deodorant. I stuck with Toms of Maine for years with unfortunate, smelly results. But Well & Good recently published a trial of natural deodorants and lead me to this winner. Very few natural deodorants come in stick form. It goes on a little rough, so be careful after shaving. But it keeps me relatively fresh all day. UPDATE: I have found better options! For my full list of the best natural deodorants, click here. 4. Anti-Aging Specialty Items: Tata Harper Discovery Kit . This might just be the one natural brand you’ve actually heard of. People freak out over the mask. I’ve only tried the serum and thought the texture was very luxurious. This starter kit is a great deal, so why not give them all a test run? 5. Long Handled Dry Brush. One of my experiments this month included grooming my skin with a soft bristled dry brush before I showered. Jury is still out on how I feel about the process. But this long handled model is affordable if you want to see for yourself. 6. Lip Balm and Nourishing Body Lotion: CV Skinlabs. Started by a cancer survivor, these unscented, soothing products are ideal for cold weather cracking. A little goes a long way, so don’t be alarmed by the price tag. I especially love the balm for my chapped lips and cuticles post-cooking. 7. Skin-Clearing Cookbooks: The Recipe for Radiance and Skin Cleanse . These two books are great for jump starting your new natural beauty routine and beginning to understand how your skin is affected by what we eat and apply. 8. Makeup Remover, Body Oil, All-Purpose Magic Maker: Organic Virgin Coconut Oil. My facialist told me she uses coconut oil for everything. I started using it as a hair mask and makeup remover, but have now progressed to body oil when nothing else seems to be keeping my skin soft and subtle. Buy a jar and keep it in your kitchen or bathroom! Linne Botanicals and True Botanicals for luxurious face oils and serums. Ursa Major for a standard cleanser that feels refreshing like Cetaphil. Osmia for those dealing with Perioral Dermatitis. The black clay face soap is your savior. Babo Botanicals for sheer sunscreen for your face. My favorites are in bold. Starred indicates those that have brick and mortar locations in select cities. LOVE this Phoebe! You know how much I love clean products. CV skincare is my favorite!! So fabulous. Hope to see you soon. Miss you. xoox HUGS!!!! Great product list! I am happy to see CV Skinless… It’s my go-to body moisturizer, and I absolutely love it. Another brand I love (and trust): Odacite. The night cream is amazing, and the starter kit is a great way to try out the line. Thanks for sharing! How does Burt’s Bees compare to these brands? I haven’t really researched it myself, but I’ve heard it depends on the product. These brands are definitely more natural. But Burts is definitely better than a lot of options out there! I’m retired from the beauty biz and I’ve tried a zillion products. I’m a mom now and I still take good care of my skin. In the past I’ve used(and sold) most of the big name products. I was on the hunt for a really good moisturizer that was also a good buy. The BEST product I can recommend is the Made from Earth Vitamin C Moisturizer. I combine it with their Green Tea Toxin Cleanser and I’m good to go. My skin is glowing! No need to spend big bucks on costly department store brands. That’s so great to know!! I will have to try – never used this brand before. Glad to hear from a fellow former big beauty gal!